Stephanie Chen gets sentimental while deciding on her desserts for "Finals Week." Her familial connections inspire all of her entries for the Winter Celebration Dessert Display. One of them is her "Mini Maple Coffee Éclairs" which happens to be her husband's favorite. Its light and airy texture is achieved through the main ingredient – Choux dough, accompanied by the right amount of eggs. This combination ultimately locks in the moisture in order to produce well shaped pastries without the threat of too much density. There is pressure for the éclairs to come out just right and Stephanie has to nail it to help her chances. Watch the full episode of "Finals Week" from The Great American Baking Show Season 2 Episode 8. 1. Preheat oven to 425 F / 218 C.
2. In a medium heavy pot, bring water and butter to a simmer over medium heat. Take pan off the heat and add flour to the mixture and stir very quickly with a wooden spoon until incorporated all the in same direction. 4. Transfer dough to a stand mixer with a paddle attachment. On high speed, add large pinch of salt then mix in eggs one at a time (4 total) until it's combined into the dough. Depending on humidity, you may not need all 4 eggs. Check the dough after adding in 3 eggs. Dough should ultimately be soft, thick, creamy-colored and smooth. 5. Prepare a baking sheet lined with parchment paper. Put dough into a large pastry bag fitted with a coupler without a tip. 6. Pipe dough and use a scissor to cut the eclairs. Shouldn't be longer than 2 inches. Use a wet finger to smooth out any imperfections. 7. Bake at 425 F / 218 C for 10 minutes, then lower oven to 350 F / 176 C and bake for another 18-30 minutes depending on size. 8. Pate choux is done when they are light and hollow sounding when you tap them. Break one apart to check that nothing inside is still wet. Right when you remove from the oven, pierce each eclair with a skewer to release the air from them. Let cool to room temp. 1. Prepare a clean heat proof bowl with a fine metal strainer on top. Set aside. 2. In a medium saucepan, add milk, vanilla and salt in a pan and put over medium heat, and bring to a boil. Whisk to avoid milk burning. 3. In a separate mixing bowl, whisk the 1/4 cup sugar, 1/8 cup maple sugar, 4 tablespoons of cornstarch and 2 large eggs until smooth. When milk boils, slowly add 1/3 of the milk mixture into the egg and whisk constantly to temper them. Return mixture back to the rest in the saucepan. 4. Cook until you get a thick consistency, whisking non-stop and very fast. Cream should slightly bubble when ready. 5. Remove from heat and pour into the mesh strainer to get out vanilla bits and any cooked egg. Incorporate the butter, one tablespoon at a time, until smooth. 6. Cover the surface with plastic wrap, directly touching the cream, let cool completely in the refrigerator. 1. In a medium frying pan, add some sliced almonds and toast for a few minutes on each side. 2. Set aside and cool before adding on eclairs. 1. Melt dark chocolate in microwave in 20 second increments on medium high power. Stir until melted but not too hot. 1. Take each of the eclairs and pierce two little holes on the bottom of the pate choux. 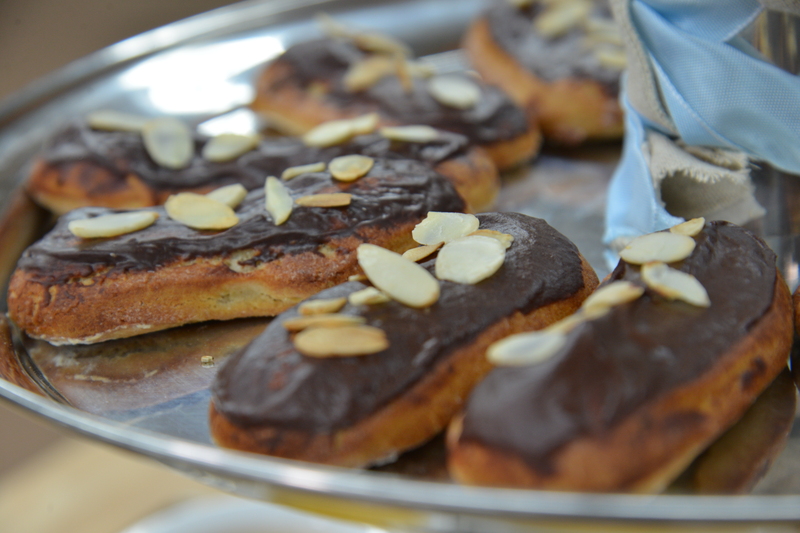 Take cooled pastry cream and inject into each of the eclairs. 2. Dip tops of each éclair in the chocolate glaze and set on a wire cooling rack. 3. Top with toasted sliced almonds.